As a contemplative, somewhat introverted teenager in the late 1980s, David Schelzel was hardly unique in his adoration for bands like The Smiths and Echo & The Bunnymen. Rather than being content to sit in his bedroom and listen to his heroes, however, Schelzel and his pals set their sights on joining them. And sure enough—in a feat that only looks more miraculous in retrospect—four high school kids from Hershey, PA, were inked to a three-record deal with Seymour Stein and Sire Records. That was 1988. 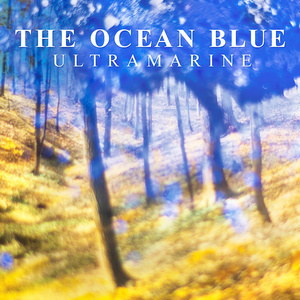 Twenty-five years later, The Ocean Blue lives on, with their first LP in more than a decade—Ultramarine—due out this month. It’s a surprisingly energized return to form for a band that’s experienced all the obligatory highs, lows, and indefinite hiatuses that often follow immediate good fortune. At their commercial peak on Sire [including their 1989 self-titled debut, 1991’s Cerulean, and 1993’s Beneath the Rhythm & Sound], the band consistently moved 100,000 units, got regular college radio and MTV airplay, and made the rounds on the late night circuit. 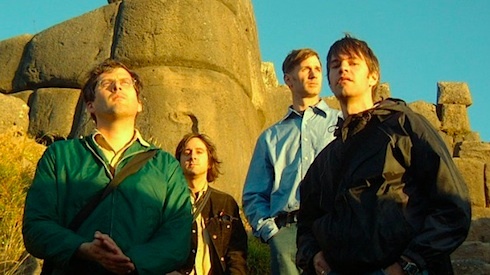 In the late ‘90s, as the line-up evolved into the current four-piece of singer-guitarist Schelzel, guitarist/keyboardist Oen Ronne, bassist Bobby Mittan, and drummer Peter Anderson, it became increasingly difficult to find that consistency—whether with a label, a sound, or an audience. Unless you count 2004’s Waterworks EP, there hasn’t been a proper, full-length Ocean Blue release since 1999’s Davy Jones Locker. And yet, as often happens with the best bands of dream-pop’s hey-day, the Ocean Blue fanbase—while perhaps smaller than 20 years ago—is more devoted and enthusiastic than it’s ever been. Accordingly, singer/songwriter and Minnesota-based lawyer-by-day, David Schelzel, has high hopes that his band’s new record will connect not just with the old fan base, but with younger fans of current music born from similar “DNA,” as he puts it. The Big Takeover spoke with Schelzel shortly before the March 19 release of Ultramarine, to talk about his inspiration for the new album, the strangeness of performing songs he wrote as a teenager, and the pros and cons of that remarkable early success. ANDREW CLAYMAN: Seeing you in Chicago a few weeks ago, it really sounded like you hadn’t missed a beat, despite the years between shows, let alone albums. How long does it generally take—or how difficult is it-- to get back in sync like that with the rest of the band after a long layoff? DAVID SCHELZEL: Ha, you know, I guess it doesn’t take that long. I mean, I can play stuff off our first four records in my sleep. I just played it so much for so many years that—as far as me just getting up there with a guitar and singing—that’s really not an issue. The newer songs are a little trickier because they haven’t been played that much. In fact, we hadn’t played some of those live at all until we played Chicago, so they took a little more time. We played a show in Seattle this weekend that was great, though, and I think we were a lot better than we were in Chicago. So hopefully we just keep improving with the new material. AC: One thing that sort of stood out to me at the show—obviously fans were excited to hear some of the old favorites—but I couldn’t help but wonder how it feels for you to be performing a song like “Between Something and Nothing,” which you wrote as a teenager. Does it seem sort of surreal, or does it still feel like a natural part of your current self? DS: I think it feels surreal [laughs]. Almost everything I’ve been doing since getting out there again has been kind of surreal. I mean, recording felt pretty natural. I’ve been writing and recording since I was a kid. But now that I’m out performing and talking with press and doing some of the things we used to do, it’s a little bit weird, for sure. 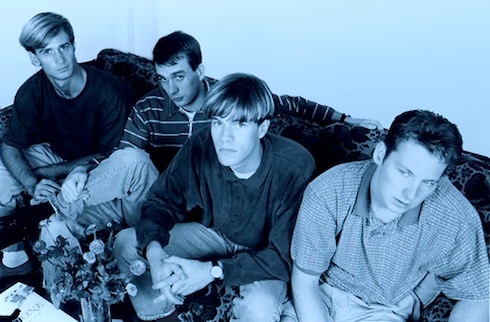 AC: Sort of along those lines, I know you’ve talked about the new record Ultramarine as a callback to the Cerulean days in a lot of ways, and I can certainly hear a lot of those elements. In terms of songwriting and particularly lyric writing, though, how does your approach or subject matter differ now from what it may have been 20 years ago? DS: Yeah, that’s a great question. I think in a lot of ways it’s the same, because I’m the same person. But in a lot of other ways, you’re right. It’s very different. For one, I’m not a teenager anymore or a twenty-something. You know, I’m a forty-something. And I have a much older perspective on just about everything. I’ve experienced a lot more of life than when I was younger. And probably, in some ways, more life than most people could relate to. I think when I was younger I kind of hadn’t done a lot of the things that most people did. We got our record deal right of high school. And I did go to college in between making all those records, but I didn’t have a lot of the same experiences that most folks have, because I was doing all this stuff with the band. So yeah, I think lyrically things are different. But I’m going to contradict myself and say, ‘but they’re still the same, too!’ [laughs] Because I’m the same guy. AC: Since you mentioned it, what do you see as the overall pros and cons now of getting signed to Sire Records at such a young age? DS: Yeah. That’s probably the way I’d break it down. There were great things about it and there were not great things about it. I think I appreciate more now how remarkable our experience was and how super lucky we were. I mean, we were signed to—in my view—the greatest label in the world at that time, right out of high school, without a lot of years of slogging it out. This was the label all my favorite bands were on, and here we were as teenagers becoming a part of that. And we immediately had success, too, with radio and MTV and everything else. All those things were great. I mean, we really had a great major label experience. I’m sure you talk to a lot of artists that have horror stories about different labels. We just didn’t have that. It was a wonderful experience, we sold a lot of records, and we were all friends and got along really well in the beginning. So those were all things on the pro side. But the con side is that I just think we were really green. I mean, I can’t listen to our early works without being like, ‘oh my gosh, I wish I could have done a better job singing that or playing that,’ or ‘that part sounds kind of goofy right there.’ So I wish in some ways I could get to do that all over again and do it better. That’s kind of the con of it-- you’re a kid and you’re green and you make stupid decisions about some things, and you’re naïve about other things. AC: Well, jumping back to the present day, now that you do have that wisdom on your side, what do you see as the sort of mission statement for this new album? What, basically, are you hoping to accomplish with Ultramarine? DS: Well, it’s funny. From our perspective, the album is done, and we’re just sharing it with the world now. But from everyone else’s perspective, they haven’t even heard it yet, so we’re just beginning. So there is this weird stage for artists, I think, when you’ve worked a long time on a record and you’re maybe sick of it and ready to move on, and yet now you’re just starting to share it with the world and relive it. But yeah, for me, there are really two main groups of people we want to reach. The first is the hundreds of thousands of people who bought our records over the years and probably have lost touch with us. We want to share with them the music that we’re making now, which hopefully they’ll like. And then the other group of people are those who’ve never heard of us before, but who may like what we’re doing. And I think there’s some interesting potential there, because in the musical landscape right now, there are an awful lot of artists who we’d fit in right next to. You know, they either like the same kind of music we like, or—whether they know it or not—sound a bit like us. Or we sound like them. It was interesting when we played Seattle, for example-- there were forty-somethings asking for autographs after the show and there were twenty-somethings. So it’s an interesting mix of people. And yeah, I think the musical landscape right now is good for us. AC: Obviously, there have been some major technological factors that have changed a great deal since even Davy Jones Locker came out. One would be the way music is recorded itself—basically allowing you guys to make this record while living in different cities-- and another is the way it’s marketed and distributed, with social media having blown up basically in the past five years or so. How big an impact have those two things had on Ultramarine so far? DS: Oh man, well we could never do what we’re doing now if things hadn’t changed. We would have had to go out and find a new substantial record deal. And it’s tough to do that. I would be very open to working with a label again, but we kind of thought, ‘hey, maybe we should try this one on our own.’ So we formed a co-op label [Korda] with some friends here in Minneapolis and decided to put the record out that way. Now, we’ve still got a publicity firm and distribution and radio people and that kind of thing. But for the most part, it’s just us kind of doing it on our own. And if the changes hadn’t happened in recording technology, where we could essentially make a record that sounds comparable to the records we’ve always made—maybe even better—or with digital distribution, where can throw something up on Bandcamp and sell it directly to people; or with Facebook, where we can communicate directly with people who like us… I mean, those things are just great tools. Now, ask me three months from now how effective I think those tools are, and I’ll be able to tell you a lot better [laughs]. You know, I think it’s still hard to get above the noise sometimes and distinguish yourself from the crowd. But I think we have an advantage there, too, because—for better or worse—we’re a known quantity for a lot of people. Every day we get notes from people saying, “oh my gosh, I can’t believe you’re back!’ Or, ‘I hadn’t listened to you guys in years and then I found you on Facebook,’ etc. etc. That kind of thing. And that’s pretty cool. AC: How important was the internet fan base in keeping the band alive over the years? Were there ever times you thought maybe there wouldn’t be any more albums, or was that always a goal? DS: Yeah, I don’t know. I think what drives us and why we’re doing this has always had more to do with the fact that we all still like making music together. Because frankly, we don’t have a very big social media base, relative to most bands. I mean, I hope it gets bigger over the coming year. But it certainly wasn’t like we had 100,000 likes on Facebook and thought, ‘Oh man, we got to do another record!’ You know, I always write and record music. I never stopped. And it just got to a point where I felt I had enough material that could become a new record for the band, and that, yeah, we all still would want to do some shows. It was more of that kind of process. AC: You mentioned earlier feeling like you fit in with a lot of contemporary bands. I actually read one interview where Beach House was brought up as sounding a bit like the Ocean Blue. As a Beach House fan myself, I had never made that connection, but after reading that, I actually did feel like there was at least a similar sort of ethereal quality there that was definitely comparable. AC: Could you eventually see using the Korda label as a way to take some of those younger, similarly minded bands under your wing in the years ahead? DS: Um, I don’t know. We’ve certainly had a lot of interest from people, but I think it’s kind of funny—well not that funny. But we just have decided we’re going to release these four records among the bands that started it [The Ocean Blue, Starfolk, Jim Ruiz Set, and Typsy Panthre] and then kind of ask that question, and see if we have anything to offer anybody else. I mean, that’s the biggest thing I don’t really know—whether we could really help anybody all that much. What we do is encourage each other, share knowledge, share the load on certain things. And that could certainly grow into something. I know I don’t have the time to run a label myself [laughs]. But maybe Allison [LaBonne, of Starfolk] does. AC: Okay, for this last bit, it’s not free association exactly. But I have chosen a handful of songs from The Ocean Blue catalog, and was hoping you could just share any random insights or memories related to the writing, recording, or performing of it. Whatever you please. DS: Well, it’s probably the coolest drum take on the record. It’s a single performance by Peter [Anderson], and he really kind of gave the whole song almost a Dave Brubeck kind of feel. I had sort of written it more as a straighforward jazz waltz, and he really stepped it up when I started singing the bah-bahs in the middle, and it really became something more unique. It’s probably the most lo-fi recording on the album, too. He probably only used two or three mics on his kit, and yet, to me, his drums on that tracks sound totally huge and cool. Then Eddie did these wild, swirly guitars that are awesome. So yeah, I like that track a lot. DS: Ah, interesting. Yeah, that’s a song I really like lyrically. “Denmark” is an interesting song. Musically, the whole track is actually an older song of ours played backwards. And I can’t tell you which one, either, because I don’t want to be sued for copyright infringement. So I’ll leave it as a secret. [Since Schelzel is also a professional copyright lawyer, his strategy here is understandable]. But the lyrics—I wrote them in Denmark around the time we were making probably the biggest transition of our career, going from being on Sire to leaving Sire and losing our keyboard player Steve [Lau], who I’d started the band with. So a lot of stuff was changing at that time. [Lau later accused his ex-bandmates of discrimination based on his sexual orientation, which the band strongly denied. All parties have since buried the hatchet]. DS: Oh wow. Good for you, Man. I love that track, and I don’t say that about a lot of my tracks. I think that’s one of the coolest recordings we ever did. I just love the way the recording came out, and I think it’s the only one on See the Ocean Blue that was an original mix done by the guys that recorded it in Memphis. Yeah, I like the vibe on that one a lot. DS: That one, yeah—I guess I’m not thinking much about lyrics. Because as soon as you said that, I’m thinking, ‘that was a fun video!’ [laughs] We shot that video in Iceland over the course of a week. And we got to go to Blue Lagoon, which is this really cool natural thermal spring, and the water is kind of a milky blue color. We just posted a photo from that shoot on Facebook today, ironically. But yeah, that was our first single to kind of really break into the pop realm. That’s a song I wrote when I was in Los Angeles, and we were mixing “Between Something and Nothing,” believe it or not. I guess I was out in L.A. to visit the label and red-do a few things on that song before it was released on the first record. So I went out one evening with the general manager of Sire and one of the assistants named Sandy. And we went and saw Nitzer Ebb—kind of this gothic, industrial band—and there was this woman in the crowd wearing a ballerina outfit, but all torn up and twisted as you might expect. So Sandy turns to me and says, “she’s a ballerina out of control.” And I just thought, ‘man, that is such a great phrase!’ And from that, it kind of bounced around in my head for a while until I constructed the song around a character in this sort of conflicted state. She appreciates the aesthetic but has some things clearly askew in her life. DS: Well, as the title would suggest, that song is about singing in front of a crowd that doesn’t really want to hear you. I wrote it around the time we were doing some drudgery touring for the first record, just before our singles broke and we started playing for people who actually knew and liked our music. The lyrics are alluding to getting my mind off those early shows in smaller towns on that first tour. You know, it didn’t last long. We were lucky and didn’t play a lot of those shows. But we played a few, for sure. You have to remember, growing up in central Pennsylvania, we were weird—really weird—in that we didn’t fit into the popular music around us at that time. It was mostly stuff that sounded like Bon Jovi. So we weren’t a hair metal band or an R&B band or Top 40. We were completely different, so you’re going to have those kinds of experiences getting started.